I met Yya in Shida Road and her style immediately caught my attention. Yya was wearing a denim jacket, a long black shirt, black leggings, red socks with black polka-dots and black shoes. Her complements were a black hat, a black handbag and a very original necklace composed by two bony and bloody hands. OMG I LOVE that necklace!!!! Great style, love the hat!! I am following your blog now! Would love you to visit mine and perhaps follow back! oh that's a really cool necklace. 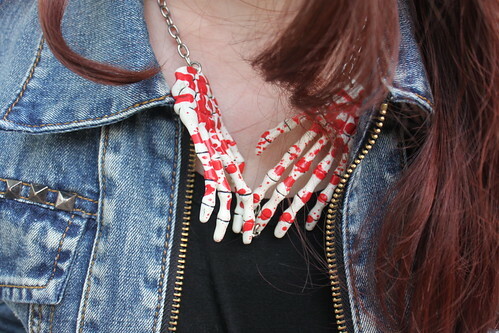 This necklace kind of freaks me out a little, but to be fair, as humans go, I am rather on the skittish side. But I do love that she's bold enough to wear whatever makes her happy! There are so many subtle details going on in the outfit, love it!